Let’s talk about corn a little bit. Although it’s a grain, it is considered moderately safe depending on individual tolerance, so this year our family has decided to try and re-introduce it into our diet. We don’t plan on eating corn that often (heck, I mentioned that I was going to eat corn six months ago and I’m just now getting around to it), but we like the idea of adding a little variety to our eating habits. Mainly, we plan on eating it in the form of tortillas, popcorn, and these little pieces of heaven you see in this recipe: arepas. Arepas are corn cakes that are popular in Venezuela, Colombia, and other parts of Latin and South America. They couldn’t be simpler to make – ground corn, water, and salt – but they bring a unique texture to other foods. Something about the crispy outside and slightly-mushy inside make them the perfect little sandwich pockets. It’s hard to describe, but they have a density and feel not unlike buttermilk biscuits, but a little grittier. There are other brands of white corn meal out there, but Harina P.A.N. originated in Venezuela, contains no additives, and is the general standard for making arepas. Sounds good enough to me. 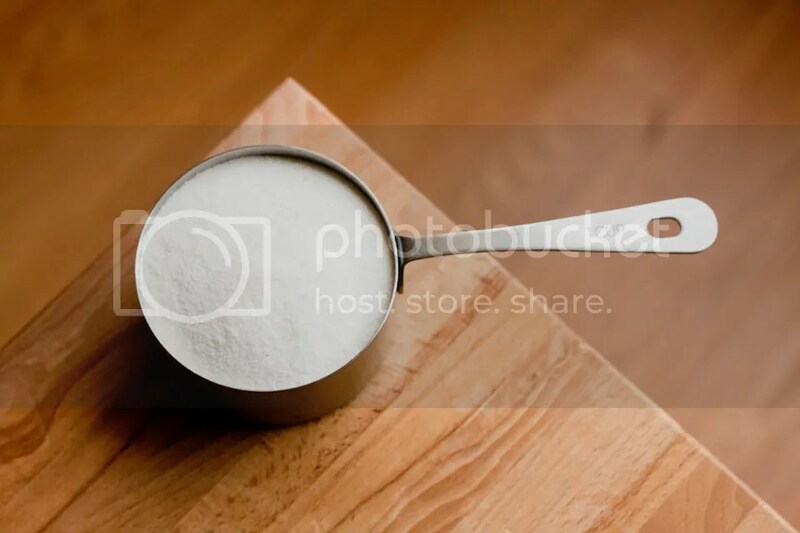 In a mixing bowl, add the corn meal and salt, and slowly pour in the water, mixing it with your hand. The consistency should be doughy, and dry enough not to stick to your hands too much. 1 1/4 cup of water should be plenty, and you may not have to use all of it. Once you have a good consistency, let it sit for five minutes. Warm up a pan with a little of the lard/butter on medium/low heat for a few minutes. 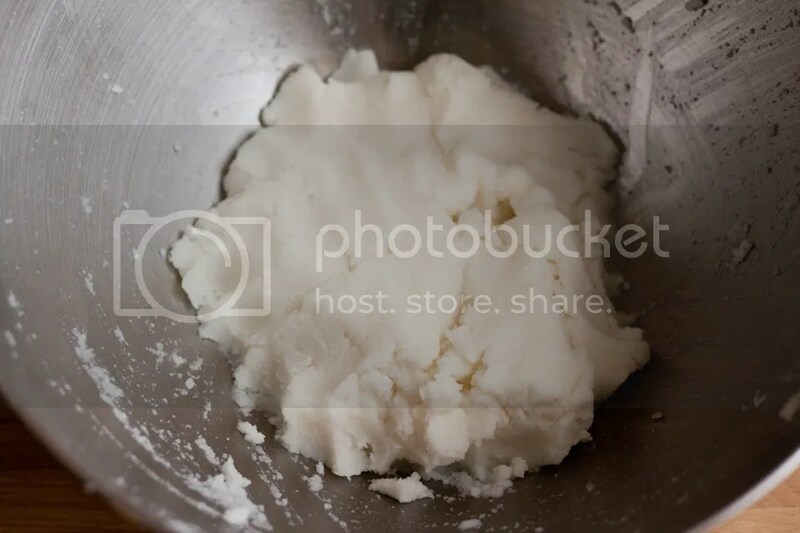 Next, form 1/4 of the dough into a ball, and then gently mash it into a hockey puck that’s about 1/2″ thick. Grill the arepa, about six to eight minutes per side, until it’s nice and browned. If it starts to smell too strongly of corn, reduce the heat to prevent scorching. Repeat the process for the other 3/4 of the dough, keeping the finished arepas warm in the oven (170 degrees should be fine). Next comes the fun part. Slice the arepa in half using a bread knife (this has officially become the only thing we use our bread knife on), butter each side, and put whatever the heck you want inside. Meat, cheese, veggies, whatever. It went perfectly with some leftover kalua pig, like in the picture at the top. I also had some cold chicken and sauerkraut with one recently, and it was awesome. So yeah, although there are plenty of people that don’t allow corn in their diet (see video below), and while I can totally dig that, we’re mighty happy to try out arepas from time to time. Thanks for this recipe..I had arepas a few months ago and really enjoy them. It will be fun to try making them myself! There’s a Venezuelan place in Falls Church, VA that does arepas! I love them & never knew how easy they actually are. Thanks for sharing! We’re not too far from Falls Church, maybe I should check them out! What’s the name of the place? La Caraquena, tell them Kaitlyn sent you! HaHA I love Nacho Libre! Now I gotta try those arepas. I think I’ll try this……nothing like warm, toasty, corn. Thank you! We have a gluten free family member and I’v’e been looking for something like this. Looks tasty! Can’t wait to try! I love cooking with cornmeal! I love corn, but we eat it in moderation because it’s so starchy. Inspirational! And scanning your blog reminded me to get the pork shoulder out of the freezer for sunday! 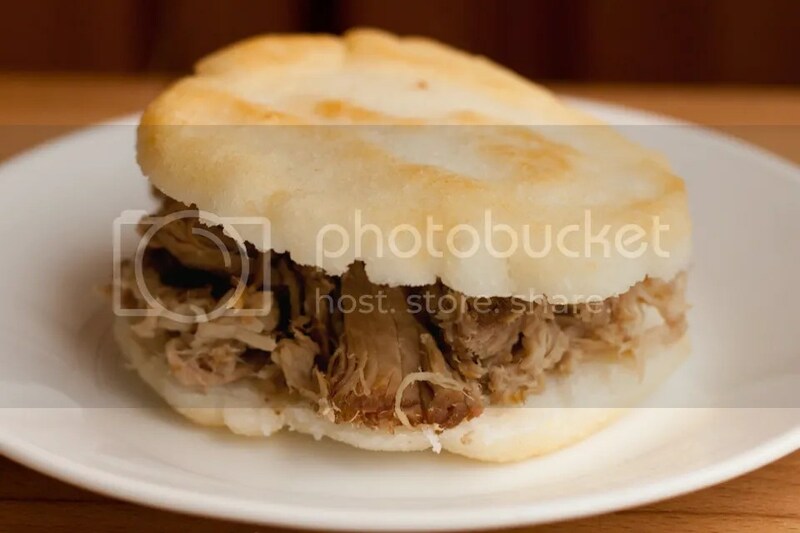 Arepas and pulled pork! Thank you!!! Would love to try this. Looks yummy! love the gluten free recipe! I’ve been looking for international recipes that don’t require a stove/oven. I cook international meals for my students every Friday but have no kitchen. Do you think I could do these on an electric griddle? YES!!! you can even boil them, they won’t be as good. Try it with something fun ham cheese, meat, scramble eggs, butter, black beans and cheese, guacamole, ANYTHING!!! Friends of mine from South America used to make me these all the time. I freaking love them and now I know how to make them too. Thank you!! Great reminder. I haven’t had any since leaving Florida last year. Congrats on being freshly pressed. This is awesome!!! 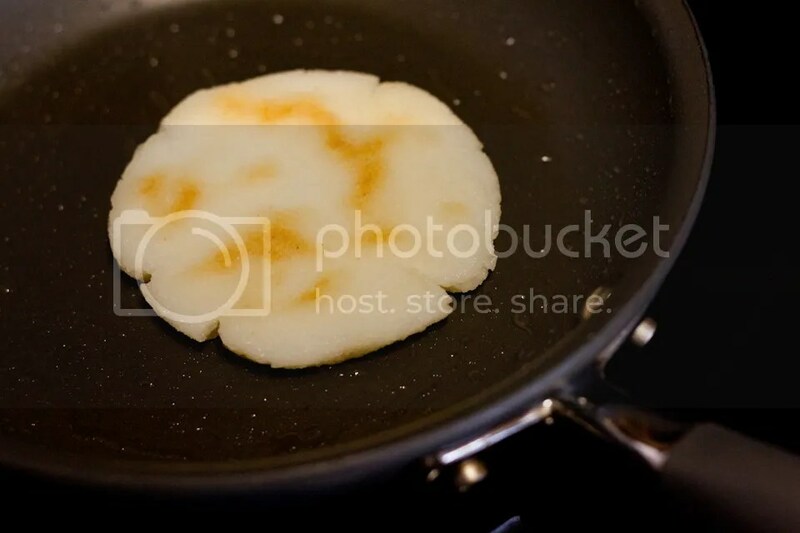 is the first time a see someone writing on his blog about Arepas… (i am from venezuela). The greater thing about arepas is that you can eat them almost with everything, with caraotas (very good) and i recommend a “reina pepiada” (an arepa with aguacate/avocado), also chicken, meat, and whatever you want to try. I have a little advise, when you are making arepas, and when you see the arepa is getting dry, wet your hand and wet the arepa a little bit to avoid the arepa to “break” – do the same when you turn your arepa to the other side. This you can do it once or two times before the arepa is ready – this is just a trick to make your arepas look better. You can also add a little bit of milk powder when you are mixing everything in the bowl, that add a very good taste and if you put your arepas into the oven for five minutes you will see how they inflate a little bit. Ahh!! i almost forgot it …. you can fry them too. Yes, they are excellent fried! Make them smaller and fry them. These are known as arepitas. You can also mix the dough with milk and some queso blanco before frying. Highly recommend! Looks delicious, I’m going to have to try making them soon. Best arepas I’ve had are at a little Venezuelan restaurant called Caracas in NYC’s East Village! So delicious and affordable! I LOVE arepas! I grew up eating them in Venezuela stuffed with all kinds of yummy fillings! My favorite was always cheese and shredded beef. There is a Venezuelan food truck in Austin serving Arepas called Budares that has a version with avocados and chicken. Thanks for a nostalgic post! I’ve never heard of arepas before but these look really yummy. I also enjoyed the Nacho Libre clip. Ha. Congrats on FP! Thank you! I stumbled across the Nacho Libre clip one day and have been saving it for something special ever since. It was a perfect fit! I live in Doral, Fl., which is better known as Doralzuela-predominantly populated by Venezuelans. Thanks for sharing how to make this simple meal. Sure beats most fast food joints (health wise), and a lot cheaper too. Good stuff! This looks delicious! I’m almost reaching through the screen to grab it! I’m Venezuelan and follow Paleo eating. Thanks for sharing a recipe. Sometimes I need a reminder being away from home! Oh my God, oh my God, I am muy obsesionada with these arepa things. I had one first time last year from a street vendor in Boston, had NO idea what it was but it smelled good so I bought one, then I went and bought another one. The ones they made were filled with cheese!!! I would love to try to make them with your recipe. The only thing that holds me back is that arepas aren’t exactly good for the thighs of a 46 years old woman! But I guess I could get over that once in a while! These would be uber-delicious with most anything but I fancy them stuffed with garlic prawns and mango-avocado salsa. Love all the Venezualans offering wee tips – like the milk powder and water tricks. Great, unifying post. Congrats on being Freshly Pressed. My daughter is a vegetarian and this looks like something that we can both eat. Thanks for this awesome blog.I’ll be back to check out your other posts. There is a Venezuelan food cart down the street from me that makes the most heavenly arepas. Your post, plus the fact that I am slightly addicted to the aforementioned food cart, has made me realize that I need to make these at home, ASAP. Love Arepas, these look fabulous! Congrats on getting Freshly pressed! I’m allergic to wheat; it gives me hives and symptoms akin to having fibromyalgia, so I’ve been wheat-free for several years. I love arepas, but I didn’t know they were this easy to make. But I’m thinking I need to make sure they’re made from non-gmo corn. From what I’ve read about Monsanto selling gmo corn directly to consumers (corn that contains a built-in pesticide that may or may not remain in the processed food product), I should make sure the corn meal I use is organic and non-GMO. Thanks for a great recipe! Hi Jilanne, that’s a good point about non-GMO corn. I just tried to research and see if Harina P.A.N. sources GMO corn but I couldn’t find anything. Given that it’s from Venezuela, their laws concerning GMO foods may be strict (like in Europe) so it might be cleaner than US corn…or it could go the other way. Thanks for bringing this up! Here in the US, imported Harina PAN from Venezuela is labeled–in English–as containing GMOs. I was a bit baffled when I saw it since there is no US law requiring the labeling of GMOs. Seemingly it was voluntarily labeled as containing GMOs for the purpose of export. The answer is YES, it does have GMOs! But even if it didn’t–the sad news is that nature does not know the boundaries of farms and cross breeding GMOs has already contaminated virtually all non-GMO crops. Unfortunately, corn, soy, canola and cotton will never be safe again. Its ruined forever. Finally, Chavez appears to have declared a ban on growing GMOs, but there is no ban Venezuelans consuming GMO’s. Chavez does not enforce his non-GMO mandate and GMOs are being grown in Venezuela, contrary to what people are being told. But with all that said–seeing these picture made me miss eating the food I grew up with…and will never be able to eat again. Like Jilanne, I also have a sensitivity to wheat (gluten) but it extends to corn as well. I suspect it must have to do with GMOs. There was another brand of the harina for arepas that my relatives brought back once and it was supposed to be healthier and it didn’t make me sick. Perhaps those do not contain GMOs–or at least less. BT corn contains its own insecticide and it kills insects by making their stomachs explode when they eat them. In humans it appears to cause something similar–bloating and similarly serious gastrointestinal issues that eventually lead to severe gluten intolerance–among other serious problems. A recent study in France indicates BT corn causes massive mammary tumors. Another study in Russia indicates GMO soy causes infertility, low birth weight and growth. Wow, Marisol, thanks for sharing! Ricas , sabrosas y muy nutritivas…a disfrutarlas. Wow, thanks for posting this recipe – cornmeal, salt, water… butter or lard for frying. I cannot WAIT to try these! Sounds delicious! I also am not a great consumer of corn, but after reading this post and seeing your most delicious looking photos, I may just have to give these a try. Thanks for the recipe. Awesome! I just tried Arepas here in NYC a couple of weeks ago, but your’s look way more appetizing. I’m looking forward to trying this recipe out! Nice, gonna have to make some of those! yummmmm I’m trying this tonight! I love arepas! The first time I had them were at Caracas in New York City. I’m excited to try this place in Falls Church. Thanks for the recipe. I just made these! They’re delicious! I added a tiny bit of sugar to add a little sweetness. Awesome! I like Arepas, had them first in Trinidad, they were in the shape of a meat pie, sort of half moon shaped. Enjoy! mmmmm….i love me some arepas! How lovely and something I will be trying soon. Very nice photos too. Thanks for the recipe! Can’t wait to try it! I love a domestic man! I used to eat arepas from street vendors in Caracas when I lived there as a kid. In retrospect, maybe that’s why I got sick a lot. Still love those arepas though. You know, we’ve had some awesome arepas nearby us, but we’ve always wondered how to make them ourselves. Well, we’ll be keeping this recipe handy. Thanks for sharing. Yes, I believe that is the same. I love arepasis, but avoided them due to GMO corn used in harina PAN. I’m going to try Bobs Red Mill corn flour, which is non-GMO. It’s not as simple as buying plain milled corn. The difference between masa arepa and plain milled corn is that the masa arepa is cooked twice. So if you were to make arepas from fresh corn for example, you would first cook the corn. Then mill the cooked corn (doesnt have to be dry) and then make and cook that into arepas. If you make them from fresh corn at home these would be more appropriately called cachapas which is like an even better arepa. Unfortunately using plain milled uncooked corn flour does not result in arepas :(. The only thing I can think of is to buy blue corn (less likely to be GMO) and cook and mill it yourself. If you have the time to do that I’m sure it would be really good.